DBX Recovery Tool from SysInfoTools is highly efficient and powerful tool that enables users to recover their important emails easily from corrupt or damaged Outlook Express’s DBX files. The main task of DBX Recovery tool from SysInfoTools is to restore the out of order DBX files that are unable to read by Outlook Express and when a range of other programs are not capable for restoring the information contained in these files. Recovers mail messages in plain text, RTF and HTML format. Recovers all properties such as subject, to, from, cc, bcc, date, etc. Repairs DBX files larger than 2 GB. Recovers attachments, including the documents and images attached to messages. Preserves the integrity of original DBX file. Easy to use and highly interactive user interface, i.e. no extra technical knowledge is required. Supports previewing of content of recovered files before saving them to check integrity of file. Restores the file at user specified location. Available for Windows 98, NT4.0, 2000, Me, XP, 2003, Vista and Windows 7. User can recover emails from corrupt DBX files using three different recovery modes. Recovered emails can be save in 5 different file types. Performs MDF file recovery in Standard mode and Advanced mode. Facilitates saving of recovered data either in SQL Server database format or SQL Server compatible Script format. 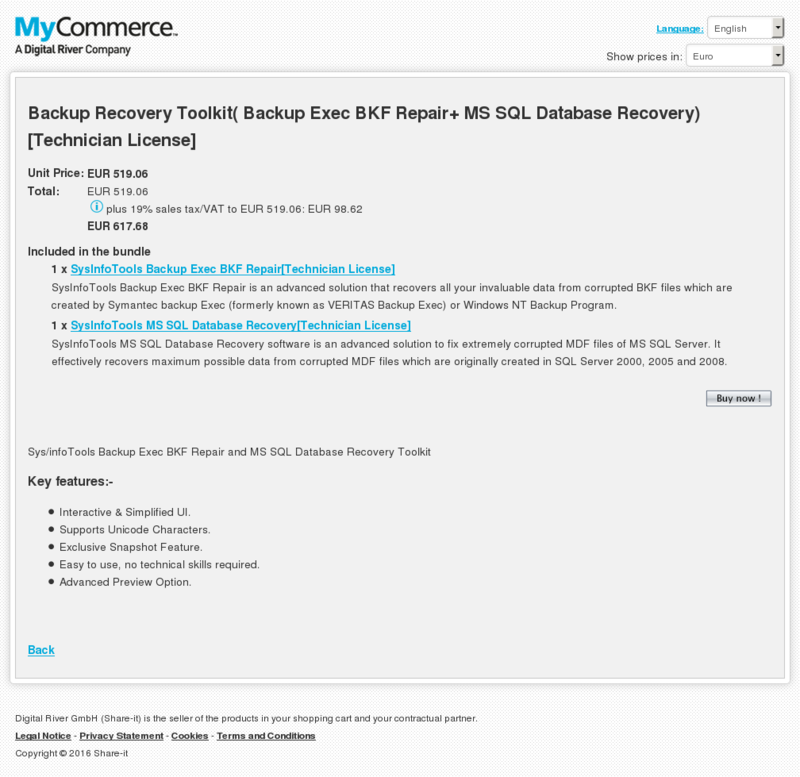 Repairs corrupt MDF and NDF file of SQL Server database. Supports SQL Server ROW-compression and PAGE-compression. Allows users to export either schema part of corrupt MDF file or both data and schema of corrupt MDF file. Sets new password for user accounts in SQL Server by replacing the original password. Cracks all types of passwords, such as: encrypted and unencrypted password. Simplified, Safe and intuitive software application with no need of technical expertise. Enable users for login which are disabled while resetting its password. Offers wide supports for MS SQL Server versions 2014, 2012, 2008 R2, 2008, 2005, 2000. Repairs highly corrupt MDB and ACCDB files of MS Access. Supports recovery of large OLE and MEMO data. Restore BLOB data. Also supports header corruption and data misalignment issues. Recovers all the data and file objects from corrupt database files. Supports recovery of corrupt files in two modes: Standard and Advance Mode. Shows preview of recovered data before saving them. 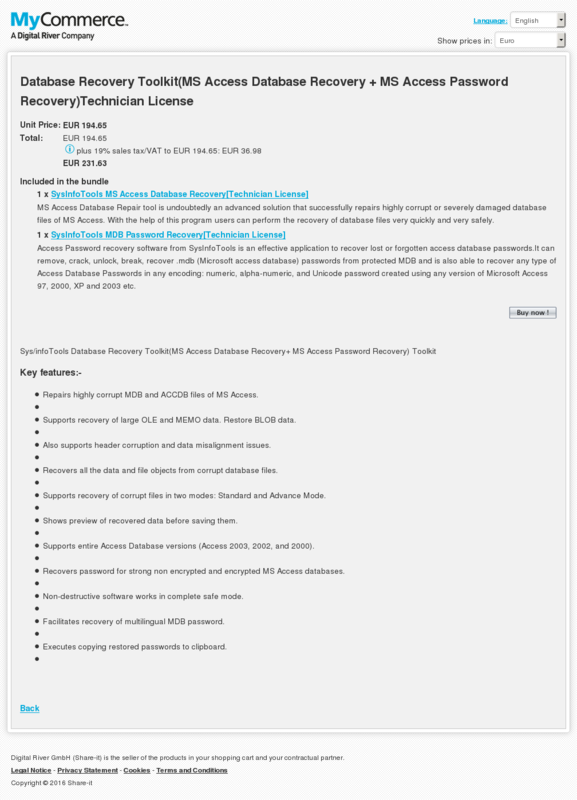 Supports entire Access Database versions (Access 2003, 2002, and 2000). 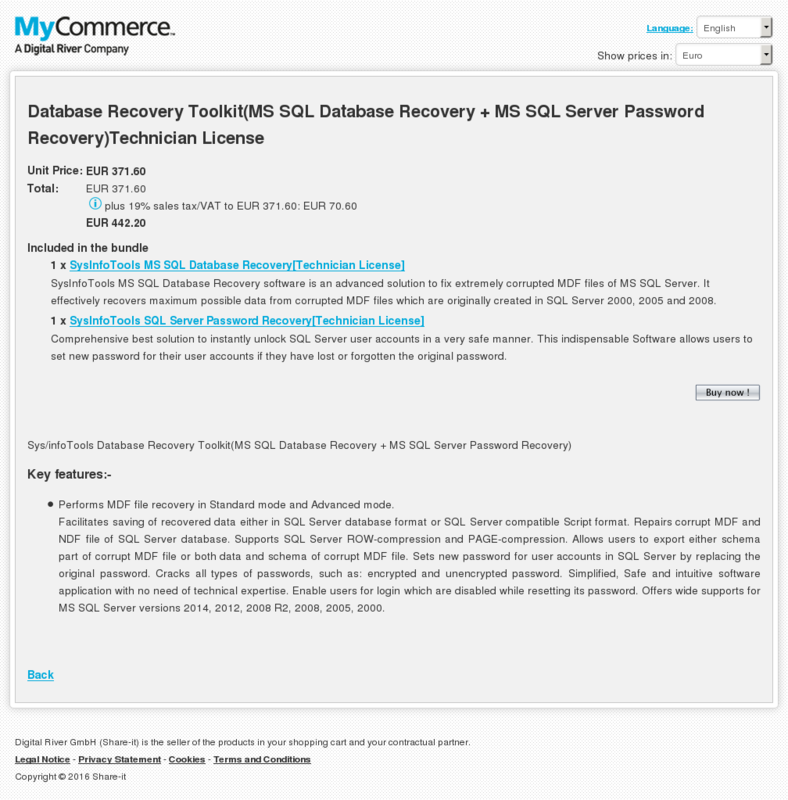 Recovers password for strong non encrypted and encrypted MS Access databases. Non-destructive software works in complete safe mode. 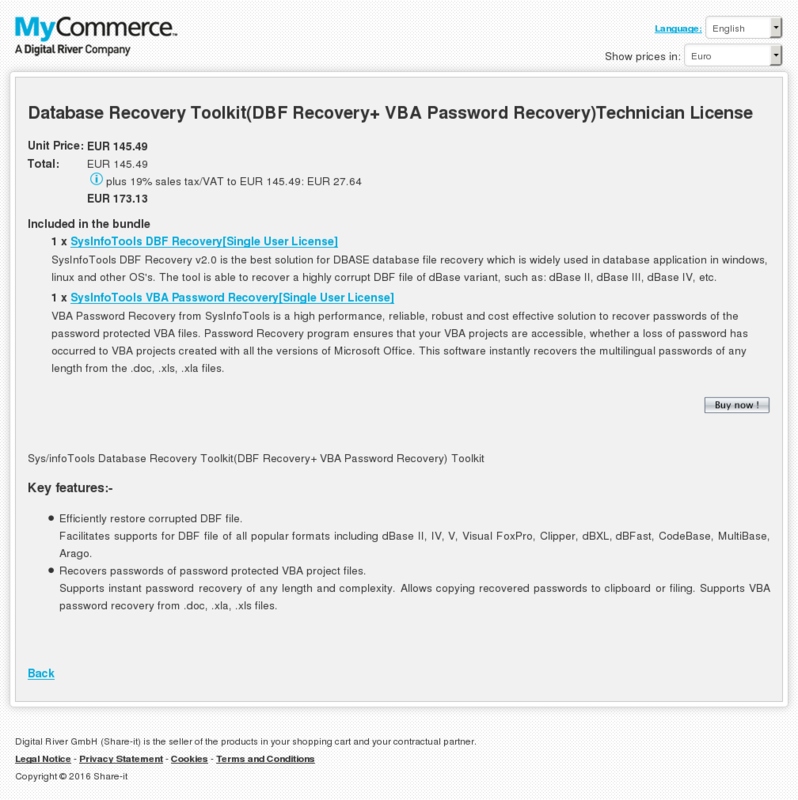 Facilitates recovery of multilingual MDB password. Executes copying restored passwords to clipboard. Efficiently restore corrupted DBF file. Facilitates supports for DBF file of all popular formats including dBase II, IV, V, Visual FoxPro, Clipper, dBXL, dBFast, CodeBase, MultiBase, Arago. Recovers passwords of password protected VBA project files. 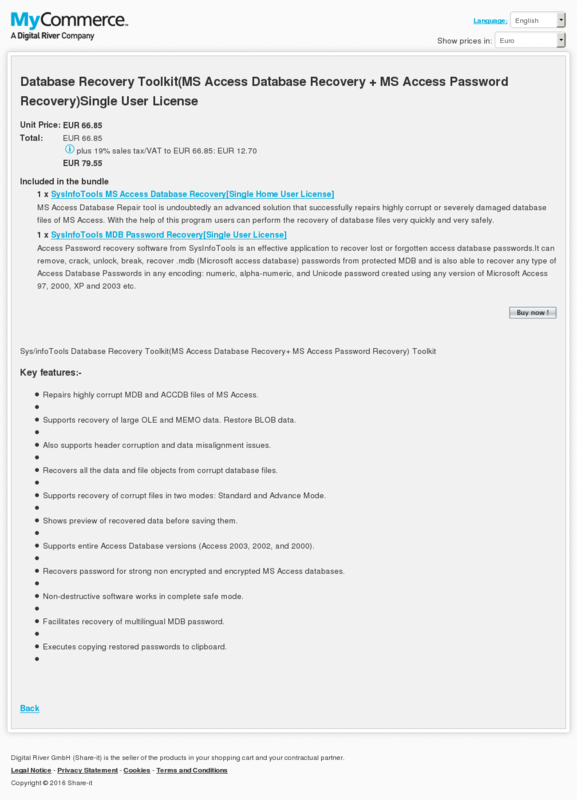 Supports instant password recovery of any length and complexity. Allows copying recovered passwords to clipboard or filing. 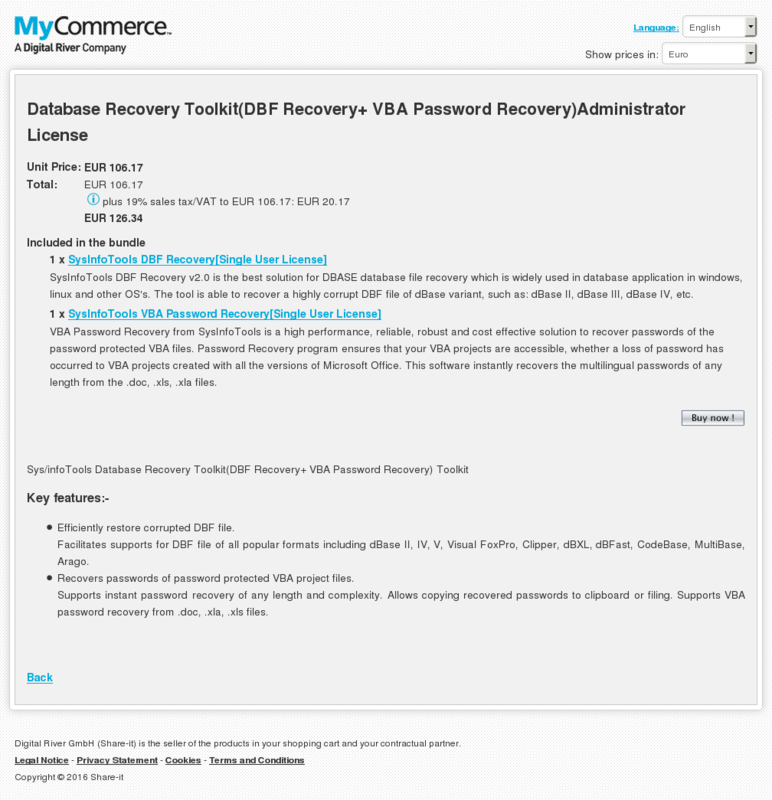 Supports VBA password recovery from .doc, .xla, .xls files. Get very smart and very effective ZIP repair software at very affordable price from SysInfoTools. SysInfoTools ZIP Repair tool is an advanced method of recovering data from corrupt ZIP files. ZIP files which are compressed by any compression utility can be successfully repaired by this program. This program uses an advanced technique of scanning, recovering/repairing and saving of ZIP files. The files which seem corrupt few moments before get fully repaired in the next moment. With the help of this tool recovery action of corrupt ZIP files is performed in just no more time which is quite impossible for other tools. Recovers a large sized ZIP file. Creates an error free backup for original ZIP files. Preserves the original file and folder structure. Extracts files from corrupted ZIP archives. Saves the file at user specified location. Checks data integrity and CRC value in the archive while recovering action. Very easy to use as no technical skills required. Supports all Zip compression modes. Shows Windows based tree structure to display files. Compatible with Windows 95, 98, Me, NT, 2000, XP, 2003, Vista and Windows 7. GUI of the software program has been changed into more attractive and friendly interface. Supports single and multiple ZIP files’ recovery. Standard mode: In standard mode corrupt ZIP file is repaired and a new fresh ZIP file is created. Advanced mode: In advanced mode the corrupt ZIP files are scanned and the recovered data extracted in file folder. Supports the preview of recovered ZIP files’ items in the preview window. Supports ZIP files of 32 bit and 64 bit. Supports recovery of ZIP files created on MAC OS. Users can search zip files from the System directory. Supports recovery of large sized zip files. Supports recovery of corrupt zip files from other media such as: floppy disk CDROM, DVD ROM, external drives etc.